Some ladies go ga-ga for flowers, or a box of fancy chocolates. Some like sparkly hand bags (they’re not called purses anymore – I just learned that). Some will swoon over a pair of designer shoes, or a fine piece of jewelry stashed in a velvet box. But to me, few things say “I love you” more than an industrial food processor or heavy duty stand mixer. I’ll take the steel of a good chef’s knife over gold or platinum any day – though I’m equally happy with a set of vintage silver flatware, or perhaps some BPA-free polycarbonate. 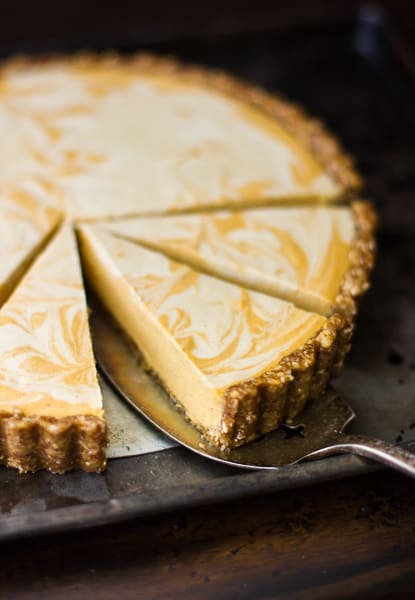 This tart was inspired by a few different sources: a raw pumpkin pie I tried at Cafe Gratitude many years ago, and Comfy Belly’s Raw Chocolate Cheesecake. 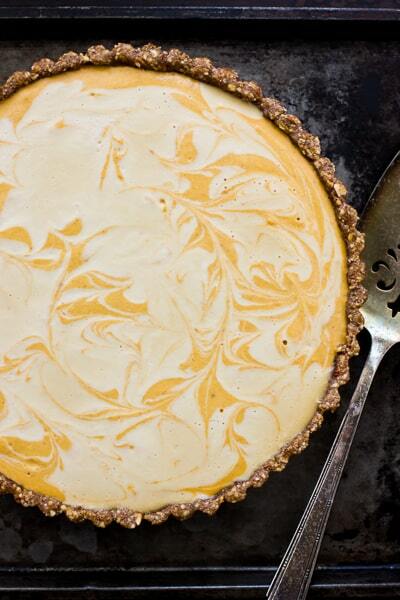 I wanted it to look as pretty as the Marbled Pumpkin Gingersnap Tart in The Smitten Kitchen Cookbook. So I made something up, and tweaked it three times to get the flavor and texture just so. I start with a crust of pecans, almonds, coconut oil and maple syrup. 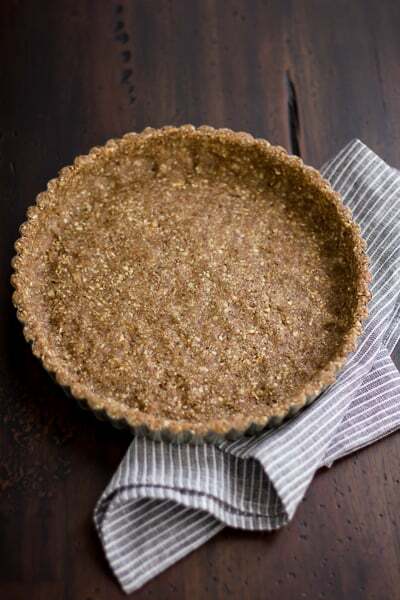 A hit of salt gives the crust a crack-like addictiveness, and ginger and cinnamon add warmth. I found that toasting the nuts lightly makes the crust infinitely more flavorful. The filling begins with a cashew cream flavored with vanilla, a bit of salt, and maple syrup. Melted coconut oil, which is solid when chilled, sets the tart to a slice-able consistency. 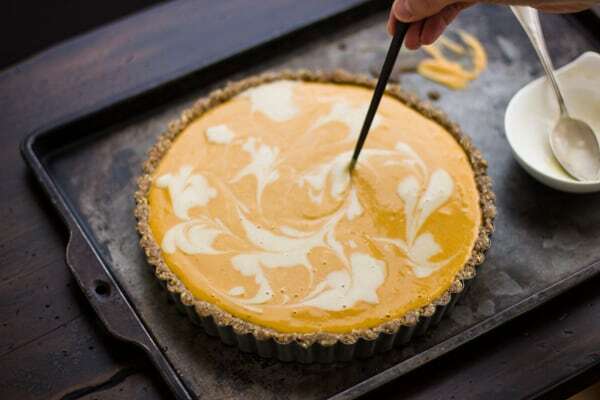 Before adding butternut squash puree, carrot juice (to give the tart a brighter hue), and spices, I set aside some cashew cream to swirl into the top of the tart. A combination of cinnamon, nutmeg, cloves, and fresh ginger give the filling a classic taste which, it you’re like me, will bring on a flood of positive Thanksgiving dessert memories. the same time, like a good cheesecake or a thick whipped cream. A few things worth mentioning: Cafe Gratitude’s original recipe calls for raw, grated pumpkin, but I prefer to roast and puree my own butternut squash, as butternuts tend to have more consistent flavor, and the thought of eating raw squash gives me the willies. I’ve given directions on how to do this in the headnote below. If you’re not already a squash puree-maker, know that the process is simple. Most of the time is hands-off while the squash bakes and then cools, and extra puree can be refrigerated or frozen for future use. Also, for this kind of dessert, it’s important not to over-process the filling once the coconut oil has been added, since this can cause the coconut oil to solidify into tiny, white speckles. If this happens, the dessert will still taste fine, but it will look grainy and curdled rather than silky smooth. To avoid this fate, work quickly once you’ve added the oil, and blend just enough to combine. 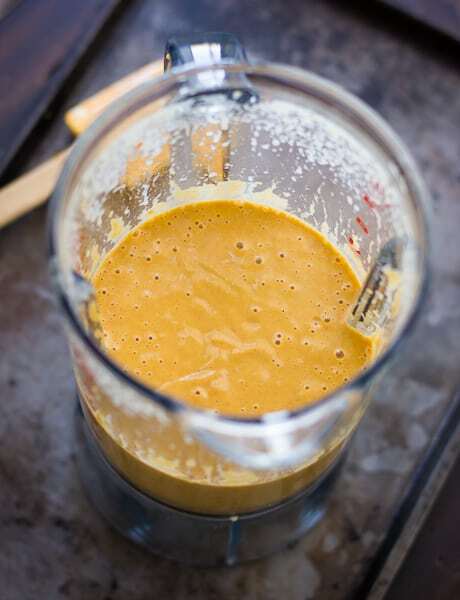 I like to stir together the squash puree, carrot juice, and spices separately to minimize the blending time. 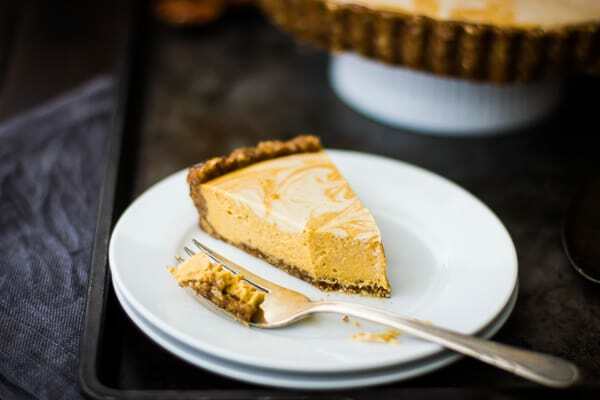 Jay insists that this is the best dessert he’s had in a long time, though he admits that his nostalgic soft spot for pumpkin desserts may have something to do with it. 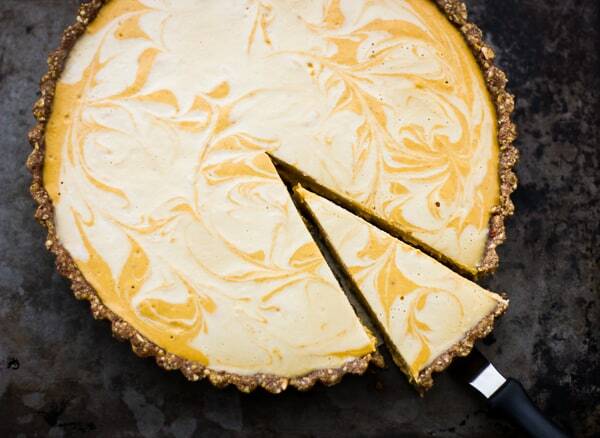 Clearly, the way to a man’s heart is through his pumpkin dessert stomach. 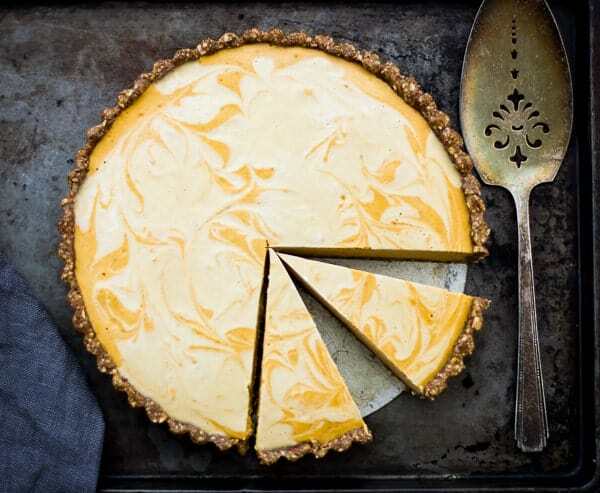 And though the way to mine may be through a workhorse of a kitchen appliance, I still wouldn’t turn my nose up at a bouquet of tulips or two..
With inspiration from the Marbled Pumpkin Gingersnap Tart in The Smitten Kitchen Cookbook, and Comfy Belly’s Raw Chocolate Cheesecake. 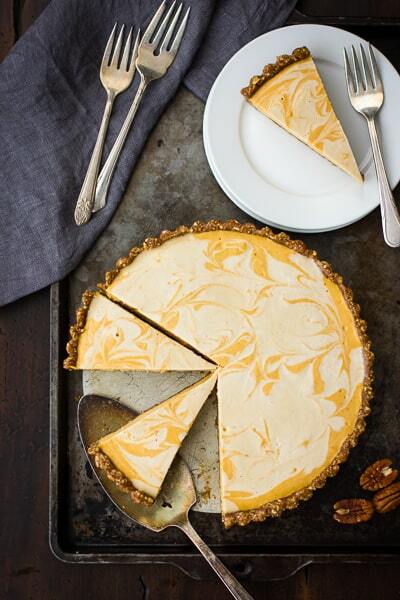 This recipe has several steps – making the squash puree, soaking the cashews, toasting and cooling the nuts (optional), and chilling the assembled tart for several hours – so you’ll want to begin this project a day ahead or early in the day. The tart keeps well airtight and refrigerated for three or four days, and the flavor only improves. It can also be wrapped snugly and frozen; defrost before serving. I use homemade butternut squash puree in the filling, as the flavor is more clean and fresh than the canned stuff. To make butternut puree, cut a butternut squash in half lengthwise. Leave the seeds in (they’re easier to scrape out post-baking) and place the squash halves cut-side down on a rimmed baking sheet. Bake at 350ºF until the squash is soft and collapsing, about 45 minutes. Let cool enough to handle, scrape out the strings and seeds and discard. Scrape out the flesh, discarding the skin, and puree in a blender or food processor until silky smooth. 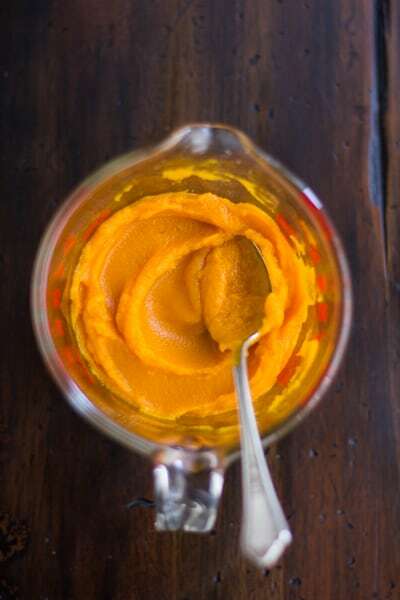 The puree will keep in the fridge for up to several days, or it can be frozen for future uses. I prefer the flavor of lightly toasted nuts in the crust, though if you prefer to go raw, or are short on time, you can skip this step. To toast the nuts, place the pecans and almonds on a smallish, rimmed baking sheet and toast in a 325ºF oven or toaster oven until fragrant and slightly darkened. Do make sure they’re completely cool before proceeding, lest you end up with steamy nut butter. 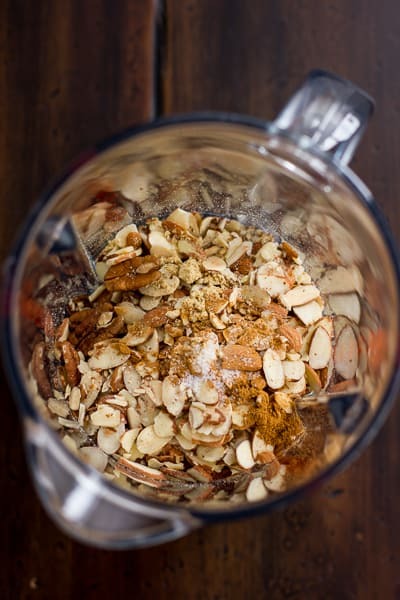 In the body of a blender or food processor, pulse together the pecans, almonds, ginger, cinnamon and salt until the nuts are finely ground (but not becoming nut butter). 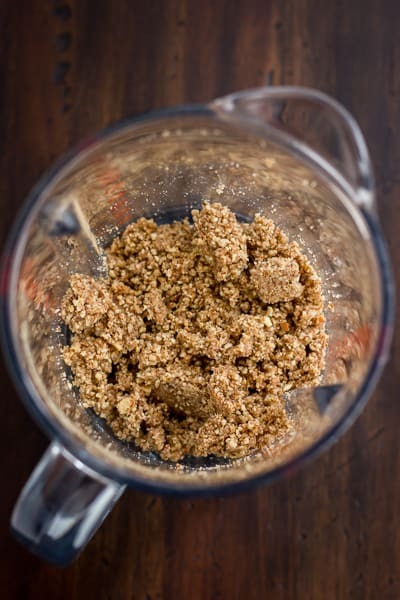 Drizzle over the maple syrup and coconut oil, then pulse just until the mixture begins to clump together. Dump the crust mixture onto an 8- or 9-inch tart pan with a removable bottom. Use moistened fingers to press the crust squarely up the sides and into the bottom of the pan. Freeze the crust while you prepare the filling. 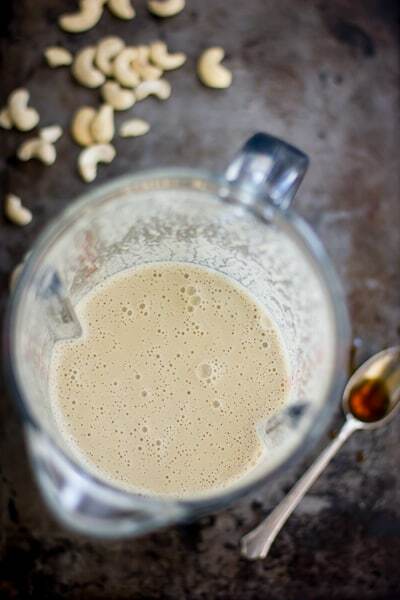 Wipe out the blender (or food processor) body, and add the soaked and drained cashews, maple syrup, and salt. Pulse until the cashews are ground. 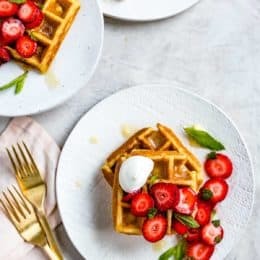 Add the water and vanilla extract, and blend on high speed until the mixture is silky smooth, about 3 minutes, scraping down the sides of the blender as needed. With the motor running, pour in the melted coconut oil; mix just until combined. Remove 1/4 cup (60 ml) of the cashew cream and set aside for the swirl. 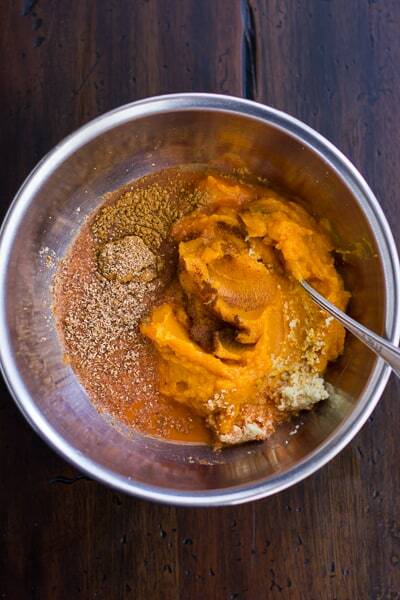 In a smallish bowl, stir together the squash puree, carrot juice, grated ginger, cinnamon, nutmeg, and cloves. Add this to the blender, and blend on low just until combined. Remove the crust from the freezer, and place on a platter or rimmed baking sheet for easy maneuverability. Pour the squash mixture into the crust. 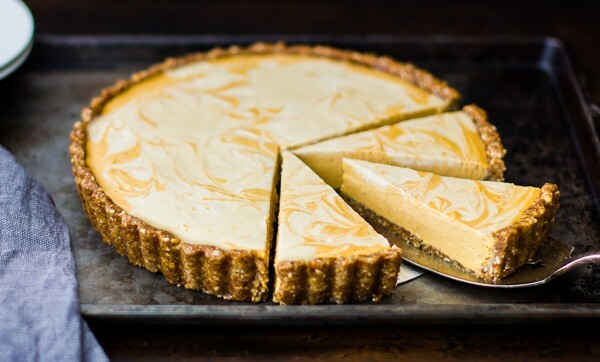 Drop spoonfuls of the reserved cashew cream onto the surface of the tart. Use a toothpick or the tip of a paring knife to gently swirl the mixture; be careful not to over-swirl, or you will lose the definition of the swirls. To serve, place the tart on a large can or an inverted ramekin. Gently east off the sides of the pan, taking care not to break the crust. Use a large, sharp chef’s knife, wiped clean between cuts, to cut the tart into wedges. The only pumpkin lover? Madness! I guess there's no accounting for taste… Thanks for the sweet note! Haha, thanks, Eileen! In a just world, pumpkin pie would be eaten year-round rather than be relegated to a single day, so say I! Wowza! This is incredible! I'll definitely have to try this one out. I love how the gingersnap crust doesn't have actual gingersnap cookies! Thanks, Katie! I usually have issues with people labeling things like nut crusts "gingersnap," but I did it as an homage to Smitten Kitchen's tart, so hopefully that makes it ok. Thanks a lot for the kind words! My mouth is watering. I want this right now! The patterns are just gorgeous. Pinning this. And love the 'gingersnap' crust- flippin brilliant. Ha! Thank you, Shu Han. 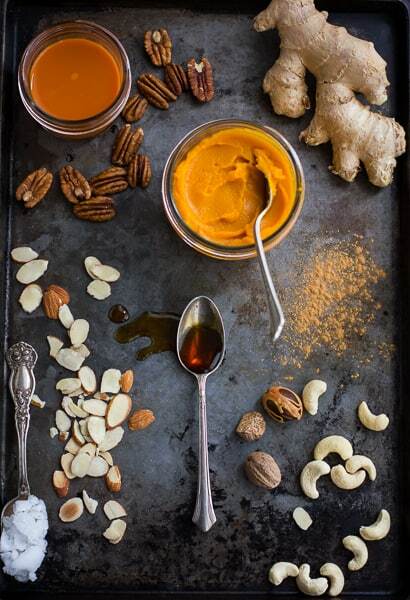 Beautiful recipe and styling… you're making me want a blender upgrade along with a slice of pie. I've always wanted to try cashew-based filling, but have never gotten around to it. This could tip the scales! Thank you, Irina! I'm admiring your recipes and styling, too! I'm so happy about our blender; I've been practically leaping out of bed every morning to make smoothies for breakfast. Hooray for modern technology! This looks exquisite, and I've been on a pinning rampage through your site tonight! Hello Alanna. What a gorgeous tart. I'm pinning this right away. And I'm also pining over your blender! Thank you for sharing! A must try recipe, I admit! I also didn't know butternut squash is also called pumpkin (?) Anyway, lovely presentation and picture so I think I'll try this out. My previous experimentation with vegan pumpkin tart was all right, nothing too special/ great about it. I also am on the look out for a nice blender and with so many choices/ price level, it's quite exhausted to get one that fits what I need for it to do! Thanks for the post and for sharing! We almost always make one of your recipes for our once a week sweet thing. We made this Sunday and it was amazing!! And it didn't make me feel like I'd eaten a sugar rock like most pumpkin pie always has. Thank you so much! You do?! That makes me so happy! Thank you for the sweet note, and I'm so glad you liked the tart! So I am going to make this for Thanksgiving – really excited about it! Because I have an abundance of sweet potatoes, I'd like to substitute them for the butternut squash. Do you think that would work as well? And – did your crust get soggy really quick? I would like to make this on Wednesday before the big day and I'm wondering if that will be alright. Thanks so much for the beautiful post! Hi Penni! 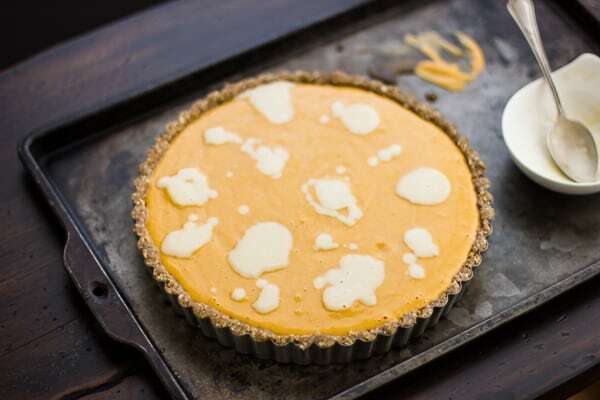 I think sweet potatoes should work well in place of the butternut; they tend to have less moisture, so the tart may be a bit more dense unless you add more carrot juice. I thought this tart only got better after a day or two in the fridge, so making it Wednesday should be perfect. I don't recall the crust getting soft. Please let me know how it goes! Alanna, I can't eat coconut oil and your recipe looks so delicious. Do you have any substitute suggestions for the coconut oil? Butter maybe? I know it isn't vegan but couldn't think of anything else that is close. I made this for Thanksgiving and it turned out PERFECTLY! I followed your recipe exactly (thank you for the great instructions) and the pie was a work of art. I was so proud! And no one shunned my vegan/gluten-free confection at Thanksgiving. I always expect someone to be reluctant, but I think the beauty of this pie overcomes any doubters. 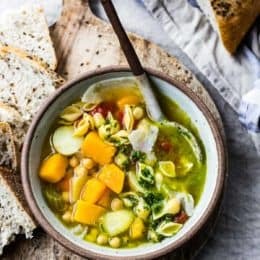 I've made many recipes from your blog and I'm always inspired by your amazing photography. Thank you for doing this work. I'm going to make a full-sized raw vegan chocolate cheesecake for Christmas Eve. 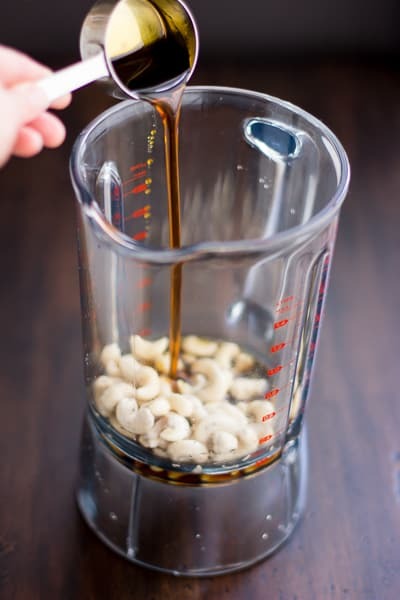 My cashews are soaking as I write … And I'll be tacking some truffles this week, too! Can't wait :-). Happy Holidays! Hi Vanessa! I'm so glad you made the tart and that it was a hit – that's awesome! Thank you for the glowing review and the super sweet words! That completely makes my day. :D I hope you love the truffles and cheesecake – be sure to come back and tell me how they turn out! This came out amazing! It looks just like the pictures. The texture of the filling is so airy and the spice level is spot on. The only thing I did differently was to add a little extra maple syrup to the filling, about 1.5 tb. it was not quite sweet enough to my taste. Different strokes for different folks :) but we absolutely love it and will definitely make again. if I don't have access to a removable bottom tart pan, is there any alternative option I could use? or will it ruin the tart?.. I was wondering, could I use orange juice instead of carrot juice or wouldn't those flavors pair well? Hi Ingrid, Hm, I'm not sure. It could be good, or the acidity might be clashy with the spices. Please let me know what you end up trying and how it goes. Could I make this on Sunday and freeze it for Thanksgiving on Thurs? hello! 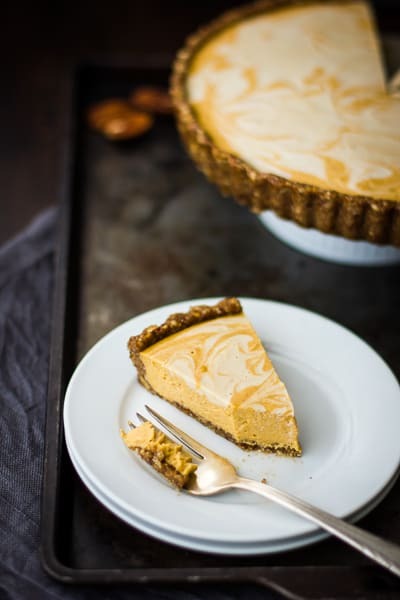 I stumbled across this amazing recipe looking for a yummy raw pumpkin cheesecake for Thanksgiving this week! I don't have a juicer though and wondering if I could just omit the carrot juice? Would that totally mess up the recipe? 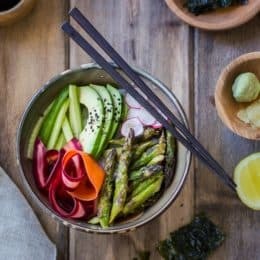 This looks delicious, can't wait to try it!! Oh, I just thought – apple juice might work!